Future Pipe Industries B.V. is one of the worlds leading manufacturers of glassfiber reinforced epoxy (GRE) pipe systems. Future Pipe Industries (FPI) is part of the Future Pipe Group, a strong globally operating group of companies that specialize in glassfiber reinforced epoxy, polyester and vinylester pipe systems. FPI has manufacturing facilities and sales offices in Europe, the Middle East, the Far East, Africa and America. 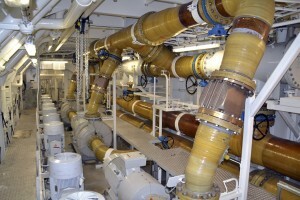 FPI offers corrosion free pipe systems including design, manufacturing and prefabrication, which last a lifetime of a ship and reduce the lifecycle cost significantly.